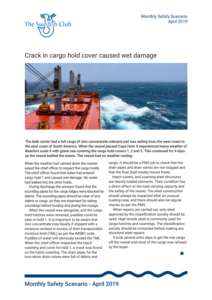 In its Monthly Safety Scenario for April, the Swedish Club describes a case of cargo damage caused by water ingress due to a crack on the hatch coaming. The incident resulted in several days of delay for the ship to get the wet cargo off the vessel, while most of the cargo was refused by the buyer. The bulk carrier had a full cargo of zinc concentrate onboard and was sailing from the west coast to the east coast of South America. When the vessel passed Cape Horn, it experienced heavy weather of Beaufort scale 9 with green sea covering the cargo hold covers 1, 2 and 3. This continued for 4 days as the vessel battled the waves. The vessel had no weather routing. When the weather had calmed down the master asked the chief officer to inspect the cargo holds. The chief officer found that water had entered cargo hold 1 and caused wet damage. No water had leaked into the other holds. During discharge the surveyor found that the sounding pipes for the cargo bilges were blocked by debris. The sounding pipes should be clear of any debris or cargo, as they are important for taking soundings before loading and during the voyage. It took several extra days to get the wet cargo off the vessel and most of the cargo was refused by the buyer. When the vessel was alongside, and the cargo hold hatches were removed, puddles could be seen in hold 1. It is important to be aware that zinc concentrate may liquefy if shipped with a moisture content in excess of their transportable moisture limit (TML) as per the IMSBC code. Puddles of water will obviously exceed the TML. When the chief officer inspected the hatch coaming and cover for hold 1, a crack was found on the hatch coaming. The drain pipes for the non-return drain valves were full of debris and cargo. It should be a PMS job to check that the drain pipes and drain valves are not clogged and that the float (ball inside) moves freely. Hatch covers, and coaming steel structures are heavily loaded elements. Their condition has a direct effect on the load carrying capacity and the safety of the vessel. The steel construction should always be inspected after an unusual loading case, and there should also be regular checks as per the PMS. When repairs are carried out, only steel approved by the classification society should be used. High tensile steel is commonly used for cargo hatches and coamings. The classification society should be contacted before making any structural steel repairs. What were the immediate causes of this accident? Is there a risk that this kind of accident could happen on our vessel? How could this accident have been prevented? What are our procedures for inspecting cargo hatch covers? How do we ensure cargo hatch covers are weathertight? Do we use weather routing? Do we record all maintenance in the PMS? How often do we inspect the hatch coamings? How often do we inspect the drain lines and valves? How often do we inspect the sounding pipes? What sections of our SMS or PMS would have been breached if any? Does our SMS or PMS address these risks? How could we improve our SMS and PMS to address these issues? What do you think was the root cause of this accident? Is there any kind of training that we should do that addresses these issues? 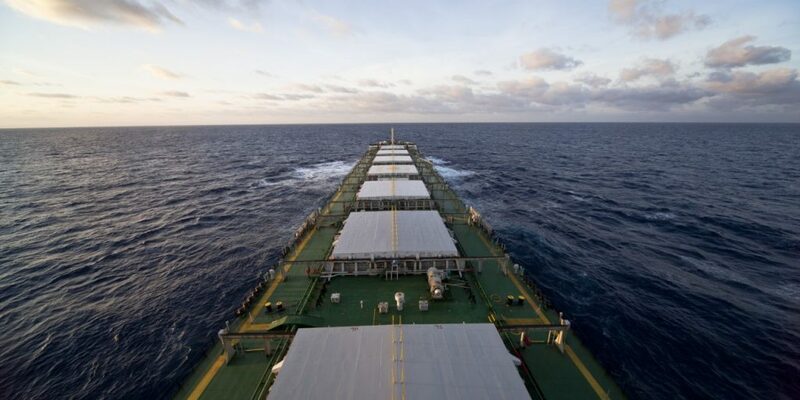 How shipping industry addresses GHG: Targets set, what’s next? ICS Class Is an independent Classification Society, Recognized Organization (RO) and Recognized Security Organization (RSO) established in Panama in 2005. Become a surveyor with our online training program. © Intermaritime Certification Services, S. A. 2006 - 2019 All Rights Reserved.